AMD originally told us that we'd have until January 9th to put together our review of the Radeon HD 7970. For a brand new GPU architecture, about three weeks with the card would be good enough to thoroughly investigate performance and deliver a complete review. Sometimes things are too good to be true. The 9th got pulled into the 22nd and three weeks turned into 6 days of testing. I have to say that Ryan performed admirably. Not only did he get all of the testing done for our 7970 review but he also ran all of the competing cards on our new PCIe 3.0 equipped GPU testbed. The testbed features an Intel Core i7 3960X running at 4.3GHz, an EVGA X79 SLI motherboard and 16GB of DDR3-1866 memory from G.Skill. The 7970 is AMD's first GCN (Graphics Core Next) based GPU. It's built on TSMC's 28nm process and will be available around January 9th. TSMC's 28nm yields are finally acceptable for mass production, so we should see a steady stream of cards once things ramp up next year. How did the 7970 perform? It's without a doubt the fastest single GPU in the world. The advantage over the GeForce GTX 580 varies, but you're looking at a 20% gain on average. That's more of an evolutionary improvement rather than the sort of upset that we often look for with these brand new architectures. On the GPU compute front the 7970 shows far more potential. We only had a limited amount of time to test GPU compute applications, but in the benchmarks Ryan ran the performance was very good. AMD has historically not focused much on building a GPU that truly excels at general purpose computing, but with GCN and the 7970 things have clearly changed. Power consumption is very good thanks to TSMC's 28nm process. At idle the 7970 uses less power than any other GPU we tested, including the old Radeon HD 3870. Under load it can consume more power than its predecessor, but it ends up being more power efficient thanks to the level of performance it's able to deliver. GPU temperatures are also quite reasonable. Assuming what we have seen is representative of mass production silicon, TSMC's 28nm process appears to be quite healthy. The only real issue with the Radeon HD 7970 is its price. The card will debut with 3GB of GDDR5 at a $549 price tag. Its performance and power consumption justify the premium over the GeForce GTX 580, but if you were hoping for something in the $200 - $300 price range this isn't the 28nm GPU for you. The 7970 is simply the flagship member of AMD's Southern Islands GPU family. Beginning early next year AMD will start rolling out derivative parts at more affordable price points. Finally if you want to know more about AMD's GCN architecture, check out Ryan's deep dive here. I like the concept of a 'recap' for major product releases. Give me a taste of the Anandtech review and point me to other publications for supplementary reading. Its a solid card for sure, I like how AMD has stepped up the underpinnings of the card to make it truly high-end (384-bit bus, 3GB default frame buffer). The price is justified given the current landscape but I think it will be short-lived at the top. Once Kepler arrives, I think there's little doubt the 7970 will be brushed aside to the 2nd (or 3rd spot) and ATI will need to counter with an X2 solution like a 7990....prompting Nvidia to go GTX 790 in response...and so on. I think it really comes down to where you are on the Tick Tock cadence for GPUs, with Nvidia or AMD being the tick/tocks. If you are currently using Nvidia's last few Ticks, there's probably not much reason for you to upgrade to 7970 for 15-25% improvement for cards that are 12-18 months old. You'll probably just wait for Kepler. If you are currently using AMD's last few Ticks, you're more likely to be tempted for that 30-50% increase in performance to replace those 14-24 month old cards. How is this a fair statement? AMD is simply charging what it can compared with where nVidia is more than happy to set the bar. Compare pricing on a 3GB GTX 580 and you get even more value. This is a halo product, it's going to have a halo price.
" 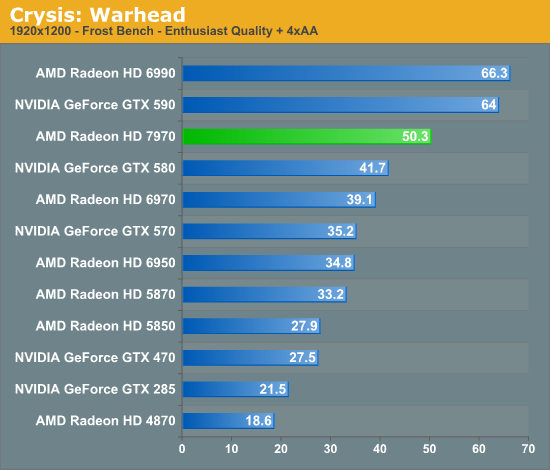 Its performance and power consumption justify the premium over the GeForce GTX 580, but if you were hoping for something in the $200 - $300 price range this isn't the 28nm GPU for you. " I'd expect people wanting something that beat a $500 GTX 580 wouldn't expect to pay mid-range pricing. I will agree relative to the 48xx and 58xx cards it isn't groundbreaking $/perf, that cannot be argued. Halo products rarely give that kind of value, RV770 and Evergreen spoiled us in that respect. It might also be fair to say that AMD was undercutting themselves when they launched those cards.